1. 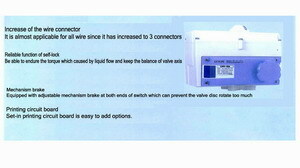 3 electric wire connectors which enable it to be applicable to nearly all wires. 2. reliable function of self-lock. 3. mechnical brake equiped on both ends of switch in case that valve disc rotate too much. 4. set-in printing circuit board is easy to add options.